Here is a recipe that is not only delicious but has sentimental appeal to me. It was one of the items that my daughter and son-in-law had on their wedding reception menu a few years ago. I love it with a side of sauteed pea pods with crispy shallots and thyme. Add a side salad and you have a wonderful, healthy meal. 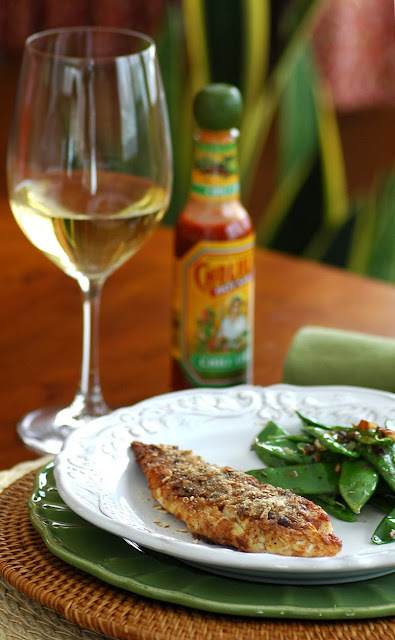 Dijon mustard and a good splash of Cholula Chili Lime sauce (or your favorite hot sauce) before coating the fish with crushed pretzels adds a zesty flavor to this fish that will have you craving more. Pass some extra sauce at the table for those who love spicy. This recipe is adapted from my son-in-law's interpretation of this dish. 6 oz of pretzels, pulverized in a food processor until the texture of bread crumbs. In a shallow dish large enough to fit a tilapia fillet, mix Dijon mustard, chili sauce, beaten egg and S&P until blended. Place the pretzel crumbs in another shallow dish of similar size. Dry tilapia loins and dip into mustard-egg combination to coat both sides thoroughly. Then, place the sauce-coated tilapia into the pretzel crumbs and pat the crumbs into the fish to adhere. Place the sauce and pretzel-coated tilapia on a large plate between layers of waxed paper and refrigerate until ready to use. Reserve some of the pretzel crumbs to add later, if needed. Heat a large, cast iron or other large, oven-proof sauté pan over medium high heat. Add 2-3 tablespoons or so of canola oil to coat the bottom of the pan. Place the sauté pan with the fish in the preheated oven for about 6-9 minutes until fish flakes easily with a fork. So good to hear from you! I can't imagine how difficult it must be for you not having your sister present in your life. I'm sure she's always with you in sweet memories. Take good care of yourself and "visit" when you can. The recipe sounds delicious and I have tilapia in the freezer. So glad to find you here. It is the most difficult thing to "carry on" after such a loss. Your family needs you and your sister would certainly want you to savor the days and enjoy your life. So do take good care. Pretzel topping sounds so good to me. I'm not sure about tilapia, but I'd love to try it on chicken! The Boys keep me smiling :) Thanks, Lynn! Glad to see you back Susan and hope the health issues are behind you. Good looking piece of fish. SO GOOD to read your post. You've been in my thoughts. Although we've not met, I feel like we're "friends" and it's always hard when a friend has a loss! This recipe looks DELICIOUS. 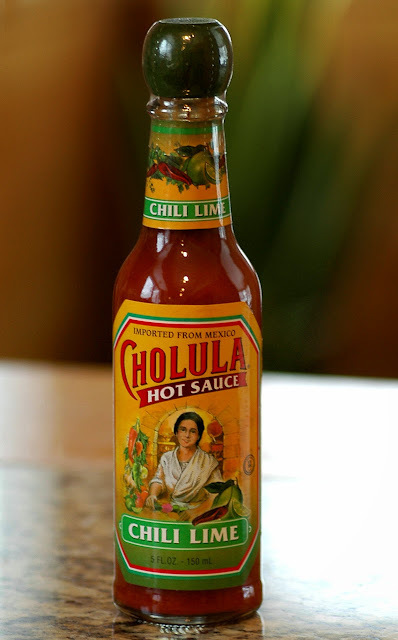 Also, I didn't know that hot sauce (my favorite) came in a lime flavor. I will be checking it out. That is so sweet, Julie. Thank you! So good to see you back!! I am not a gourmet cook - but always enjoy your posts and hearing about all the wonderful dishes you prepare and share with us. It is good to see you back. Take care of yourself though- I know this must be a difficult time for you. Will do :) Thanks so much. Taking little steps. Thanks so much, Debbie :) Will do! So GOOD to see you back, Susan. 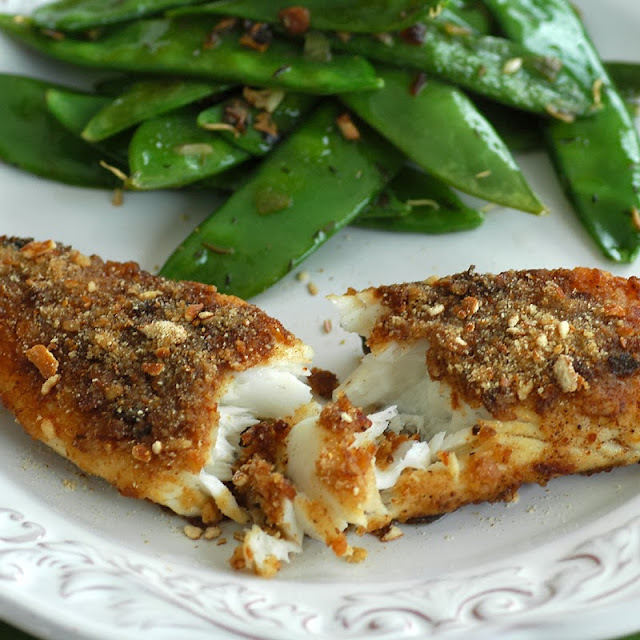 The pretzel crusted fish looks so delicious ! You are so kind, Angie. Thanks so much! i just had fish in the freezer; thanks for a great recipe and so glad you are back with your old self again. Susan I am so sorry for your health problems. In Greece we say that one bad things never comes alone, it brings more with it! You are a strong person and I am certain that you will regain your stamina, strength and love for life that have been damaged by the ugly event of loosing your sister. Time is a big healer and the will for life always wins. Your fish looks very crusty and delicious! Welcome back my dear! Wonderful words, Katerina. Thank you! We've missed you and your wonderful cooking. I hope you do get better. Take care of yourself, dear lady. My thoughts are with you to thrive and come through this sad time. Thanks for the heads up about the sauce... looks delish. Thanks so much, Deana. I never knew what an affect it would have on me. I'm going to say the same thing everyone has - so glad to hear from you and so glad you're back. I've thought of you often and how hard it must be to lose your sister. I'm sorry to hear you've also had problems with healthy. What a scare to go to the emergency room (been there!). What a lovely meal. I've never used pretzels for a coating, but I can see that is about to change. Take good care of yourself and remember, we'll be here thinking of you. Thank you, Sam! I've never passed out before and that was a bizarre experience. I was actually dehydrated from taking medication for a very bad cough and cold. I'm being more attentive to water intake now! El pescado es tan delicioso para mi una gran receta,abrazos. I am so glad I have stopped by today. I am deeply sorry about your loss. I cannot imagine. Truly. I have been so saturated with elderly parent care this past 14 months that my own visits to sites like yours have not been happening. Even in my "real" life, I have not kept in touch with beloved friends... I hope you can feel my hug. I know :) Thanks, Monique! Happy to see you back dear Susan…… I know how difficult is carry on after a loss.....please take care of you dear. I'm sure she's always with you in sweet memories….A warm hug …. Very difficult! I still question it. Thanks, Chiara! So glad to see you back, Susan! I've been wondering how you're doing. Hope you're doing better each day. Love the tilapia and hot sauce works for me, along with the pretzel crust. Take care. Hugs! I hope you find cooking and blogging to be therapeutic Susan after your loss. To find joy in the things you love again is a sign of strength and healing. Loving the recipe as well. Glad to have you back in the community. I'm hoping that's the case, Val. Thanks so much! Of course, you knew that, but I. well, I'm at a loss for words (which is rarely the case). It's good to see you! I have been thinking and wondering about you. Glad to know that you are OK now. The fish looks delicious and makes a beautiful and delicious meal! Thank so much for your warm thoughts, Joyce! Susan, it's so nice to see you back. It's hard enough to say good-bye to your only sister. I'm sorry you have been faced with some additional challenges and hope that you will feel strength and comfort in the days ahead. 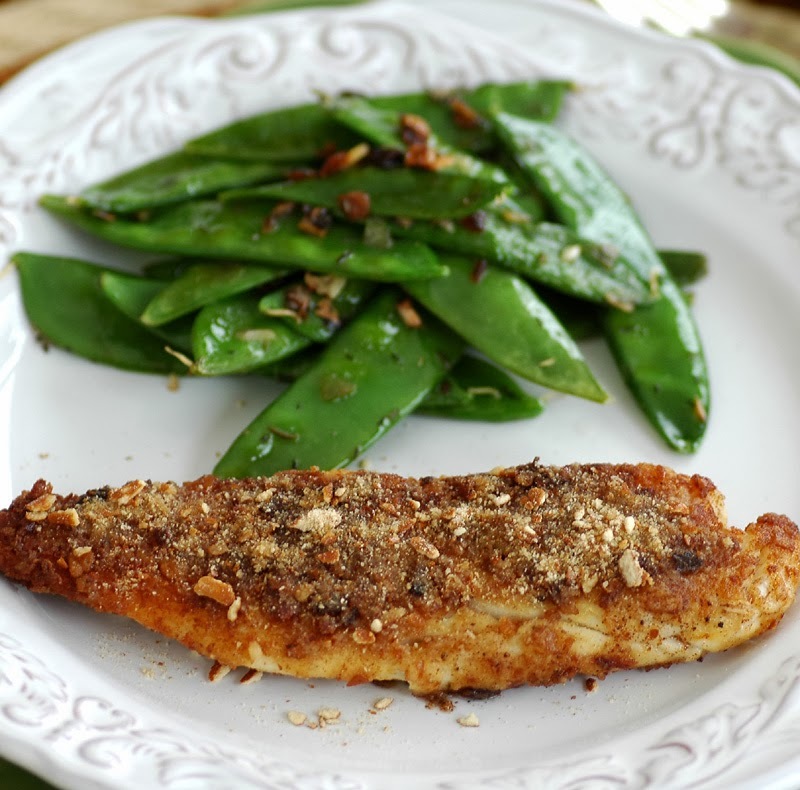 Your talapia recipe looks amazing. I have got some just waiting for a delicious new way to prepare it. Thanks for sharing...and take things slow and easy. Very advice is well taken, Gnee. Thanks so much! I'm so happy to see you back. It is difficult to be creative or do much of anything when you've been through such hard times. I say "One day at a time". Take care of yourself and know that you blogging friends are thinking of you. Such a clever idea!! Need to try it… Looks wonderful! Sorry that your health was affected. I am glad to see you back. The tilapia looks so yummy. I love the crust idea. Keep getting healthier. I'm sorry to hear about your sister. It's goo to see that you are getting back to your hobby here. Sentimental meals are always a nice thing, too. Take care! Good idea :) Thank you, Amy. I'm happy to see you back at your computer, Susan. It takes a long time to get over such a big loss. I think its one step at a time, one day at a time. You have been in my thoughts and prayers. Getting back into the kitchen is good therapy. That is very kind, Cathy. Thank you. I am so very sorry about the loss of your sister. My prayers are with you and your family. This is a wonderful dish. Thanks for sharing it. P.S. I agree with Cathy time in the kitchen will be like therapy. Take care of yourself. Thank you very much, Cath, and also for your kind words below. je viens de comprendre en lisant tous les messages, je vous souhaite beaucoup de courage et la vie continue avec notre peine qui un jour s'estompera avec le temps, courage et merci de tous ces partages de vos recettes ! j'adore!!! Have a nice day. Cath. Susan, this tilapia just looks delish. Have no words to express how much I loved the recipe. "Pretzel-crusted" is something new! Thank you very much, Purabi, I hope you enjoy it.